Four young men sat attentively around a dining room table in suburban Denver on a sunny March day perfect for riding their bikes. They ignored their smart phones for over an hour. They are Ian McPherson, Maxx Chance, Liam Dunn, and Taylor Schmidt, members of a new elite under-23 cycling team. They were learning details about the nature of the organization sponsoring them, COGA (Colorado Oil and Gas Association). Also present were team mentors Taylor Jung, Jason Short, and Anuthee Korder. Jung manages and directs the squad. Some might not align an outdoor, community-based activity like cycling with this industry. That’s exactly why COGA is championing the young sportsmen. The association hopes the team can spread a message regarding its members’ goodwill contributions in the state. Jung points out that not many people know, for example, that the industry supplied relief for Colorado communities affected by the September, 2013 flood disaster. According to data supplied by COGA, donations totaled $2.1 million. In mid-July over two thousand cyclists will have a chance to see the message in action at the Courage Classic. The team has invited COGA energy company employees and their friends to pedal over mountain passes with its riders to reach a $100,000 fundraising goal for the benefit of Children’s Hospital Colorado. “There are a lot cyclists in the energy industry, which shouldn’t really be surprising since people who live in Colorado tend to love outdoor activity, regardless of what industry they work for,” notes Jung. Another objective for the organization is to increase understanding about the oil and gas business. On that sunny March day James Cole, an energy subject matter expert with Colorado Legislative Services, supplied industry context and answered questions. Christina Delpone, a COGA employee, passed around information in paper and thumb drive form. They talked about how most of the parts on their bikes can be traced back to the oil and gas industry, as well as the fabrics stitched into cycling kits. Jung first contacted the organization through Delpone. “When Taylor first met with COGA he came prepared with a COGA specific proposal that aligned with our organizational mission and values,” she says. About 50,000 people in Colorado work in the industry, according to a fact sheet on COGA’s website. The organization’s representatives indicate the state ranks sixth nationwide for natural gas production and ninth for crude oil production. Significant growth over several years has brought more attention to the industry’s activities and raised concerns among some residents of mineral-rich communities. At the meeting the riders and mentors speculated about the response to their title sponsor. Would people welcome a new cycling benefactor? Or would those critical about the industry give them an earful? Whichever it would be, the four U23 riders seemed confident about handling either situation. 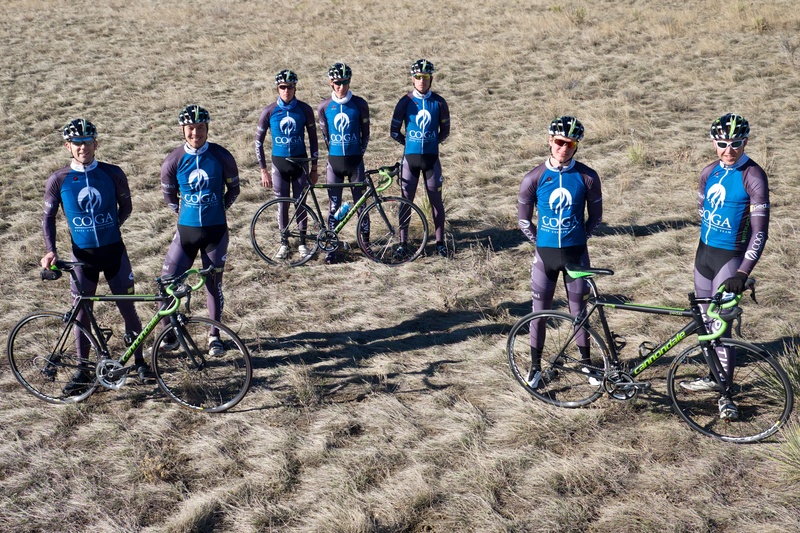 From the team and sponsor’s perspective, ideally when people see these young men wearing the COGA logo while training or racing their bikes they will connect the industry with a sport that is a part of a healthy lifestyle for many Coloradans – or at a minimum become curious about the flame insignia. Jung says he’s not received any negative reactions thus far. By choosing U23 riders for its first cycling sponsorship venture COGA supports a cohort of ambitious bike racers who, Jung says, needs assistance to make a successful leap from junior competition to the serious senior ranks and also lacks the attention and resources focused on other adults or juniors. Jung devotes himself to their cause. 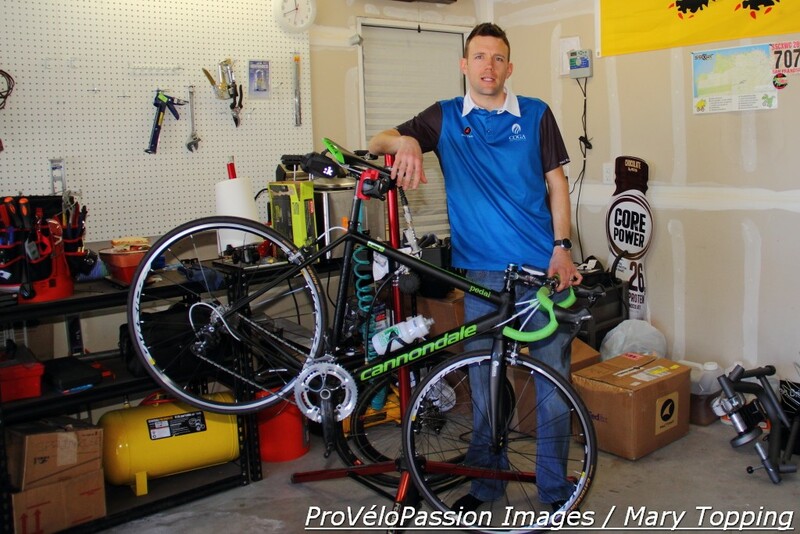 He launched his first development outfit in 2012 under the name pedal p/b Cannondale. Pedal, a bike shop in Littleton, also backs the current elite team. Jung owns the COGA Elite Cycling Team through his management organization, Rocky Mountain Velo. The four U23 riders frequently race in the same field as mentors Jung, Short, and Korder. In their early thirties, the mentors can call on fresh memories regarding the chase for glory and struggles faced by their young charges. Together with this guidance the riders benefit from logistics planning, transportation, housing when traveling, fully built Cannondale CAAD10 bikes outfitted with Shimano Ultegra components, and performance coaching if a rider hasn’t yet secured it. Additional equipment sponsors on board are Cannondale for helmets and gloves, Pactimo for performance-grade kits, Fizik saddles, and Continental tires. This season riders expect to compete in a set of major events they likely couldn’t enter on their own; that could be due to cost or coordination for travel and items like mechanical assistance during events. Racing fees are covered for events that include the Joe Martin Stage Race in Arkansas, the eleven-day Wisconsin Tour of America’s Dairyland in June, and Oregon’s Cascade Cycling Classic in July. Collegiate cycling offers a development opportunity for the U23 group and all four of riders compete as members of collegiate squads at Fort Lewis College, the School of Mines, or the University of Colorado. However, the collegiate road racing season is short and concludes in May when local and national competition is just heating up. From the racing perspective the team has already enjoyed success with three wins. That means podium and finish line photos featuring the COGA insignia in communities across the Front Range and beyond. Even when they aren’t winning, the riders have proved able ambassadors for their title sponsor. Last weekend after the three-day Superior Morgul road race ended, Jung walked along the finish line, meeting people, handing out business-sized cards titled “Frack Facts,” and talking about the oil and gas industry’s support for cycling. Anyone interested in joining the team at the Courage Classic can contact Taylor Jung for more information.